I know that corporations market to the people who use their products. And I am a consumer of P&G products (and also a mom). I brush my teeth with Crest. I wipe our counters with Bounty paper towels and our tushies with Charmin. I wash my clothes with Tide and I clean my dishes with Cascade. You know who else uses those products? My husband. He shaves his face with Gillette razors. And he has changed countless baby tushies in Pampers. And he wipes counters and does laundry and washes dishes all with P&G products. In fact, it’s my HUSBAND (the FATHER in this household) that is brand loyal. Not me. I would happily buy whatever is on sale that week at the store if it was up to me, but I’d have to deal with dirty looks from him. 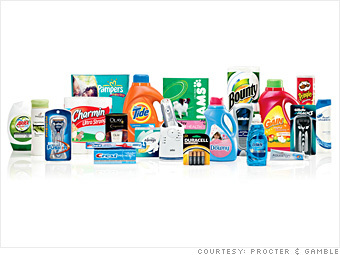 Are P&G products are only for women to use? I had no idea it was 1965 when no men did housework or cared for children. Parents’ roles in the home (and this is in a two-parent, hetero home) are changing where fathers are doing more housework and mothers are doing less. According to recent time use data , full-time working men and women spend about the same amount of time during the work week on household tasks except that men watch a little more television and women do a little more cooking. Proctor and Gamble make everything known to man. They make Tide and Crest and Pampers. Every. Thing. Couldn’t they pick, I don’t know, ANY OTHER PRODUCT USED BY MEN and thrown in some “Thank you, Dad” for good measure? The ad is infuriating for other reasons. I get that P&G wants to target consumers, but only slightly more women watch the winter Olympics than men. And don’t more men participate in skiing and hockey than women? Beyond targeting who you THINK your consumer is, companies might consider taking a flying leap into the 21st century and thinking about family life in a modern way. That’s what General Mills did when they included a biracial family in a 2013 Cheerios ads. The ad garnered lots of attention, so kudos to General Mills for recognizing that their customer base is diverse. Though stay-at-home dads don’t mind being overlooked by marketing departments, they do wonder about advertisers’ myopic focus on a 1950’s family form. Last time I checked, it was 2014 and not 1965. I know for certain that if our daughter takes up some winter sport like downhill skiing, she’ll have her father to thank for spending time with her on the slopes and for doing her laundry. While I might keep some things running around the house, I’m not the only parent who can support her. I’m just no help in the winter sports department–I quit skiing last year. This entry was posted in everyday life, family, fatherhood, gender equality, kids, lessons learned, marriage, media, parenthood, personal, sports, television and tagged fatherhood, gender, P&G ad, parenthood, winter olympics. Bookmark the permalink. 80 Responses to Dear Proctor and Gamble, Where are all the dads? Gender roles are interconnected and interdependent. You can’t fix just one gender role. Reinforcing the gender role for men by excluding them from housework and child care is by necessity reinforcing the gender role for women. Thank you so much for noticing and commenting on the portrait of men in the media. This is something often over looked in a culture obsessed with women’s rights. I love this!! I feel the same way when I watch advertisments like this. All I can think is, “Soooo men don’t do dishes or laundry or clean their houses? Oookay I thought it wasn’t the 1950’s anymore.” It’s so frustrating how sexist advertisers can be, showing in the Proctor and Gamble ad that moms are the ones who raise children, not dads. Very infuriating statement, and totally inaccurate. Bit of a latecomer to your post, but here in the UK we get these ads too and they drive me mad. My husband has a son from his previous relationship – his ex considers herself a single mum because he doesn’t live with them anymore – fair enough, but their son does not just have one parent, he has a very involved, very loving father. I know there are some dbag dads out there who have little or nothing to do with their children, but at the same time there are probably a vast number more great father’s out there. Also just because most men go out to work and aren’t always around so much to be able to do some of those sorts of roles that are portrayed in these kinds of ads, doesn’t mean they don’t matter. I am irked when men are made out to be idiots, incapable of knowing how to wipe down a surface, or change a nappy. I would have thought most people have a panic moment for the first time they had to change one! My father was often working away during my childhood, but when he was home he helped out a lot, he did whatever he could for us. And my husband helps out around the house, he hoovers and does dishes and cooks. This is second nature to him – I’ve not had to coach him or give him pathetic withering looks because he was incapable of doing it. So P&G – how about saying something more like ‘Proud to Support Parents’. No sponsor type comments, no singling out either or. Great post – and glad it’s not just me that feels Dad’s get a bit of a bad time sometimes.